The US is at the forefront of an international arms development effort that includes a remarkable assortment of technologies, which look and sound like they belong in a Hollywood science fiction thriller. From microwave energy blasters and blinding laser beams, to chemical agents and deafening sonic blasters, these weapons are at the cutting edge of crowd control. The demand for non-lethal weapons (NLW) is rooted in the rise of television. In the 1960s and ’70s the medium let everyday Americans witness the violent tactics used to suppress the civil rights and anti-war movements. The global economic collapse coupled with the unpredictable and increasingly catastrophic consequences of climate change and resource scarcity, along with a new era of austerity defined by rising unemployment and glaring inequality have already led to massive protests in Spain, Greece, Egypt, and even Madison, Wisconsin. From the progressive era to the Great Depression to the civil rights movement, Americans have a rich history of taking to the streets to demand greater equality. Meanwhile, tens of millions of dollars have been invested in the research and development of more media-friendly weapons for everyday policing and crowd control. This has lead to a trade-in of old school weapons for more exotic and controversial technologies. The following are six of the most outrageous “non-lethal” weapons that will define the future of crowd control. It sounds like a weapon out of Star Wars. The Active Denial System, or ADS, works like an open-air microwave oven, projecting a focused beam of electromagnetic radiation to heat the skin of its targets to 130 degrees. This creates an intolerable burning sensation forcing those in its path to instinctively flee (a response the Air Force dubs the “goodbye effect“). The weapon was initially tested in Afghanistan, but later recalled due to a combination of technical difficulties and political concerns, including the fear that ADS would be used as a torture tool making it “not politically tenable,” according to a Defense Science Board report. The tens of millions of dollars spent to develop the ADS did not necessarily go to waste, however. While the weapon may be too controversial for use on the battlefield, it appears that nothing is too sadistic for use on US prisoners, so the ADS has since been modified into a smaller version by Raytheon, for use in law enforcement. Last year, the renamed Assault Intervention System (AIS) was installed at the Pitchess Detention Center’s North County Correction Facility at the behest of the Los Angeles County Sheriff’s Department (LASD). Former LASD Commander, Charles “Sid” Heal had been lobbying for the pain ray for years, calling it the “Holy Grail of Crowd Control,” due to its ability to make people scatter almost instantly. The device is operated by a jail officer with a joystick, and is intended to break up prison riots, inmate brawls and prevent assaults on officers. Sheriff Lee Baca added that it would allow officers to quickly intervene without having to physically enter the area to incapacitate prisoners. The pain ray’s use in the Pitchess Detention Center is a pilot program. If successful, the weapon could find its way into other prisons around the country. The National Institute of Justice has also expressed interest in a hand-held, rifle-sized, short-range weapon that could be effective at tens of feet for law enforcement officials. The Personal Halting and Stimulation Response rifle, or PHaSR, is a massive laser shooter. PHaSR technology is being co-funded by the National Institute of Justice (NIJ), Joint Non-Lethal Weapons Program (JNLWP), and the Office of the Secretary of Defense, and is being developed by the Air Force Research Laboratory. While JNLWP is interested in the technology for military applications, NIJ is focusing on its law enforcement use. So what is the purpose of this light-shooting toy? Well, it won’t kill you, but it will temporarily blind you — or as the NIJ prefers to say, it will “dazzle” you into disorientation — by shooting you with two low­-power diode­-pumped lasers. After the US agreed to the Blinding Laser Protocol in 1995 under President Clinton, the Pentagon was forced to cancel several blinding laser weapon programs that were in the works. But the PHaSR rifle can skirt this regulation because the blinding effect is apparently temporary due to its low-intensity laser. According to a U.S. Air Force fact sheet, “The laser light from PHaSR temporarily impairs aggressors by dazzling them with one wavelength. The second wavelength causes a repel effect that discourages advancing aggressors.” The JNLWP website says that a significant amount of research and experimentation is still required to gain a full understanding of the safety, military effectiveness, and limitations of these future capabilities. The Albuquerque Police Department now has Taser shotguns in its arsenal. Most of us are familiar with hand-held Tasers and understand that they only work if the police are standing pretty close to you (about 20 feet). But Taser has developed the Taser X12, a 12-gauge shotgun that instead of firing lethal bullet rounds, is designed to fire Taser projectile rounds. Known as Extended Range Electronic Projectiles (XREP), the XREP cartridge is a self-contained, wireless projectile that delivers the same neuro-muscular incapacitation bio-effect (a fancy way of saying electric shock) as the handheld Taser, but up to 100 feet. According to a July 21 press release, Taser International has taken the XREP to the next level, teaming up with the Australian electronic gun company Metal Storm to enhance the 12-gauge Multi-Shot Accessory Under-Barrel Launcher (MAUL). The two companies will combine Metal Storm’s MAUL stacked projectile technology to “provide semi-automatic fire as fast as the operator can squeeze the trigger,” which boasts a full weapon reload of up to five rounds in less than two seconds. Picture five rounds of Taser XREP cartridges flying out in less than two seconds up to 30 yards away — that is the plan. In September 2010 Raw Story reported that the rate of Taser-related deaths were on the rise. The story cited an Amnesty International report from 2008 that found 351 Taser-related deaths in the US between June 2001 and August 2008, a rate of just slightly above four deaths per month. About 90 percent of the victims were unarmed and did not appear to pose any serious threat, according to an article in the Boston Review. The Amnesty report points out that Tasers are “inherently open to abuse as they are easy to carry and easy to use and they can inflict severe pain at the push of a button without leaving substantial marks.“ In Amnesty’s US 2010 report, the Taser-related death toll had increased to 390. If the MAUL-Taser combined shooter find its way into police departments around the country, it may not bode well for the rate of Taser-related deaths. Another project of Taser International, which was unveiled in 2009, is the Shockwave Area-Denial System, which blankets a large area with electrified darts, and a wireless Taser projectile with a 100-meter range, helpful for picking off “ringleaders” in unruly crowds. In 2007, Taser’s French distributor announced plans for a stun-gun-equipped flying saucer that fires stun darts at criminal suspects or rioters; however, it has yet to be unveiled. Clearly there is no limit to Taser International’s capacity for creativity. Calmatives are chemical or biological agents with sedative, sleep-inducing or similar psychoactive effects. Although the 1997 Chemical Weapons Convention prohibits the use of riot control agents in warfare, JNWLP and NIJ have long considered calmatives for both military and law enforcement applications, such as dispersing a crowd, controlling a riot or calming a noncompliant offender. The most well-known and widely used riot-control agents are tear gas (CS) and chloroacetophenone (CN), also known as mace. A few ways that more advanced non-lethal calmatives might be administered, depending on the law enforcement environment, would include a topical or transdermal skin application, an aerosol spray, an intramuscular dart, or a rubber bullet filled with an inhalable agent. 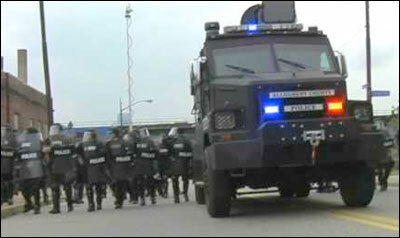 Pentagon interest in “advanced riot-control agents” has long been an open secret, but just how close we are to seeing these agents in action was revealed in 2002, when the Sunshine Project, an arms-control group based in Austin, Texas, posted on the Internet a trove of Pentagon documents uncovered through the Freedom of Information Act. Among these was a fifty-page study titled “The Advantages and Limitations of Calmatives for Use as a Non-Lethal Technique,” conducted by Penn State’s Applied Research Laboratory, home of the JNLWD-sponsored Institute for Non-Lethal Defense Technologies. Penn State’s College of Medicine researchers agreed, contrary to accepted principles of medical ethics, that “the development and use of non-lethal calmative techniques is both achievable and desirable,” and identified a large number of promising drug candidates, including benzodiazepines like Valium, serotonin-reuptake inhibitors like Prozac, and opiate derivatives like morphine, fentanyl, and carfentanyl, the last commonly used by veterinarians to sedate large animals. The only problems they saw were in developing effective delivery vehicles and regulating dosages, but these problems could be solved readily, they recommended, through strategic partnerships with the pharmaceutical industry. Little more was heard about the Pentagon’s “advanced riot-control agent” program until July 2008, when the Army announced that production was scheduled for its XM1063 “non-lethal personal suppression projectile,” an artillery shell that bursts in midair over its target, scattering 152 canisters over a 100,000-square-foot area, each dispersing a chemical agent as it parachutes down. There are many indications that a calmative, such as fentanyl, is the intended payload—a literal opiate of the masses. Researchers are in the process of developing the Mob Excess Deterrent Using Silent Audio or MEDUSA (that’s right, from Greek mythology), which uses a beam of microwaves to induce uncomfortable auditory sensations in the skull. The device exploits the microwave audio effect, in which short microwave pulses rapidly heat tissue, causing a shockwave inside the skull that can be detected by the ears. MEDUSA’s audio effect is loud enough to cause discomfort or even incapacitation. It may also cause a little brain damage from the high-intensity shockwave created by the microwave pulse. MEDUSA’s intended purpose is deterring crowds from entering a protected perimeter, like a nuclear site, and temporarily incapacitating unruly individuals. So far the weapon remains in development and is funded by the Navy. The Long Range Acoustic Device, or LRAD, built by American Technology Corporation, focuses and broadcasts sound over ranges of up to hundreds of yards. LRAD has been around for years, but Americans first took notice when police used it in Pittsburgh to ward off protesters at the 2009 G-20 summit. It is generally used in two ways: as a megaphone to order protesters to disperse; or, if they disobey, as an “ear-splitting siren” to drive them away. While LRAD may not be deadly, it can permanently damage hearing, depending on how it’s used. Similar sonic blasters have proven deadly. One is the Thunder Generator, an Israeli-developed shock wave cannon used by farmers to scare away crop-threatening bird. According to a Defense News reportlast year, the Israeli Ministry of Defense has licensed a firm called ArmyTec to market the Thunder Generator for military and security applications. It works using gas from a cylinder of domestic liquid petroleum, which is mixed with air and then detonated, producing a series of high-intensity blasts. Patented “pulse detonation” technology ensures high-decibel blasts. With an effective range of up to 50 meters, the makers say it is extremely loud but will not do any lasting damage. They warn, however, that within 10 meters the Thunder Generator could cause permanent damage or even death. The application of pain to control or coerce people into submission helps achieve the desired aims of perception management, while sheltering the public from the brutality of such devices. Perhaps these less-lethal tactics for crowd control do result in fewer injuries. But they also severely weaken our capacity to enact political change. Authorities have ever more creative ways to manage dissent, at a time when the need for change by popular demand is vital to the future of our society and the planet.